With its high-ranking schools, tight-knit neighborhood, and proximity to nearby attractions, Los Alamitos offers the best of suburban living. Many residents love the central location of Los Alamitos, taking advantage of its proximity to urban centers, beachfront relaxation, and world-class entertainment. However, it's equally satisfying to spend the day exploring Los Alamitos itself: soaking in the cultural history at St. Isidore Historical Plaza or enjoying the many locally-owned shops and restaurants. At the end of the day, it's always an incredible feeling to head back to your close community and beautiful home. When you live in such a lovely location (with an amazing climate), it's natural to want to enjoy every aspect of your property — especially your outdoor spaces. 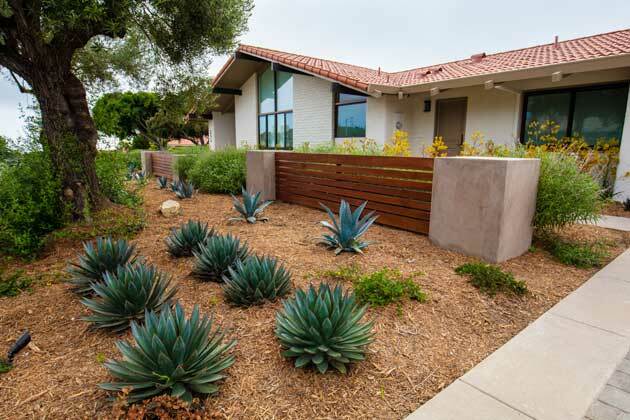 Let's take a closer look at what outdoor living could look like for you — and how Cutting Edge Landscape Design could make it a reality. Creating the Perfect Property: What Does Outdoor Living Mean to You? 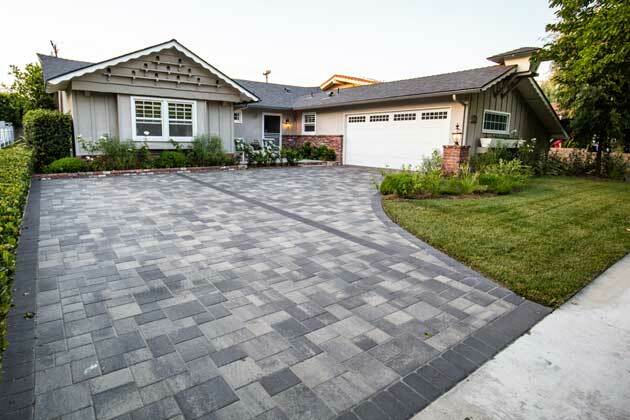 The climate here in Los Alamitos — with an incredible 283 sunny days per year — makes it a perfect location to embrace outdoor living. In essence, the concept of outdoor living means that you open up your perception of home to include your yard, lawn, patio, and deck. By doing so, you'll expand your options for year-round outdoor enjoyment and entertainment. But what does outdoor living mean to you? Do you love the idea of a sparkling blue pool to cool you off on a warm summer day? Maybe you have always envisioned working on your golf game from the comfort of your home. If you love the idea of having friends, family, and guests come over to enjoy a communal meal outside, you've probably dreamed of a fully-outfitted outdoor kitchen. Which elements of outdoor living are most important to you? What does your outdoor living space look like, in a perfect world? How can you make the most of your property? At Cutting Edge Landscape Design, we'll work with you throughout the process to create your ideal outdoor living space. Get in touch with us today if you're ready to get started. Your perfect outdoor kitchen will soon become a favorite gathering space for the whole family (and the envy of your neighborhood!). If golfing is your passion — or simply a hobby you can't get enough of — then a custom-designed putting green would be an amazing addition to your property! Whether you want to practice your stroke, invite your friends over for a friendly challenge, or teach some of your family members the finer points of golf, an at-home putting green makes it all possible. We will work with you to design an optimally shaped and sized putting green that will not only offer you hours of entertainment — but add a beautiful splash of green and an unmistakable refinement to your property. 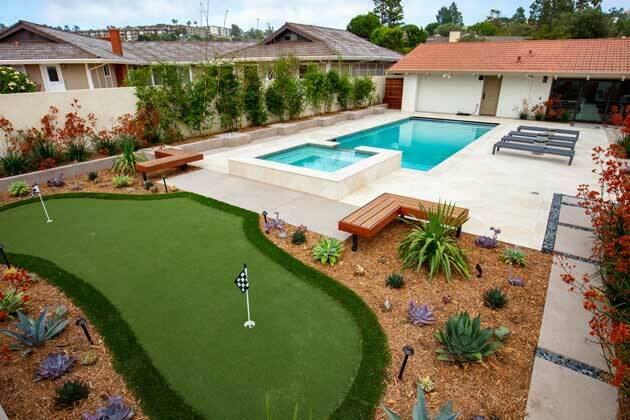 The sky's the limit when it comes to pool landscaping and water features on your Los Alamitos property. At Cutting Edge, we can create a tranquil customized oasis — right in your backyard. Toasted marshmallows. Quiet conversation. Warm hands on a cool evening. 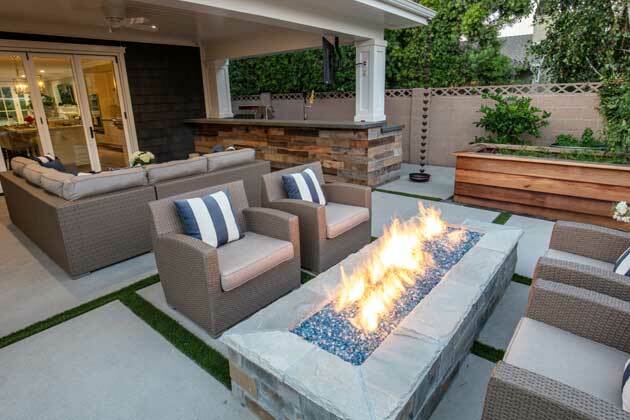 There's nothing like an outdoor gas fire pit for creating a sense of community, optimizing the sunset hours, and treating your friends to a relaxing experience. At Cutting Edge, we create gas fire pits with safety and efficiency in mind. Our designs and guidance ensure that your fire pit stays safe, contained, and well-maintained. Here is Los Alamitos, the sunset doesn't necessarily mean the end of the day. With balmy nights in the summer and cool evenings in the winter, you might find yourself aching to take a dip in the Jacuzzi once the sun has set. Or perhaps you love the idea of being able to entertain far past dusk and enjoy a pleasant evening outdoors with friends and family. Whatever the case, outdoor lighting is an important aspect of safety and security. Prevent trips, falls, and confusion with stately and custom-designed outdoor lighting that provides a cheering ambiance to your outdoor spaces. In addition to the safety element, outdoor lighting contributes to the overall beauty and elegance of your property. When we design landscapes, we always consider the property as a whole. How will a well-placed patio create a neat, dry setting near your pool? 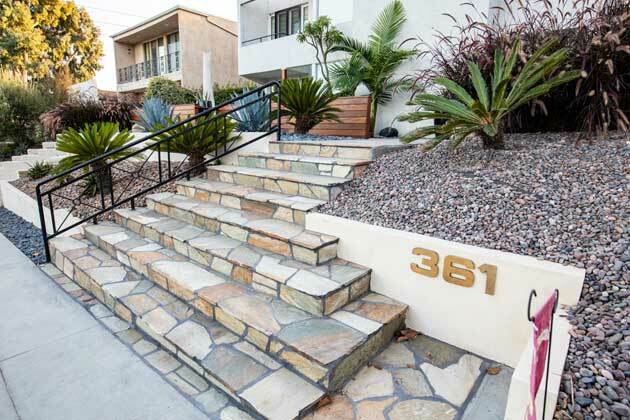 How do elements like walkways and staircases bring it all together? By designing with these elements in mind, we create a landscape that's so much more than just the sum of its parts — instead, it's a unique, cohesive outdoor living space that will offer years of delight, enjoyment, and luxury. Why Choose Cutting Edge Landscape Design? Experienced. Years of experience means that your outdoor living space is in capable hands. Full-service. Because Cutting Edge is a licensed general contractor, we can handle every aspect of your project in-house. College-educated. Our college-educated horticulturists, architects, and designs bring their knowledge to each and every project. Above all, we prioritize providing excellent and collaborative service to our clients — at every step of the process. We recognize that there are many landscaping companies to choose from and that deciding which one to invest your money with is a big decision. At Cutting Edge, we promise to be available for you. We are never too busy to take your call or listen to your ideas, questions, or concerns. Our professional, college-educated team members will deliver results that you can find nowhere else. Their attention to detail and drive to always do their best work will put you at ease throughout your entire project. Contact us today, or give us a call at (310) 406-2251 for the attention you and your home deserve and results that will leave you breathless! 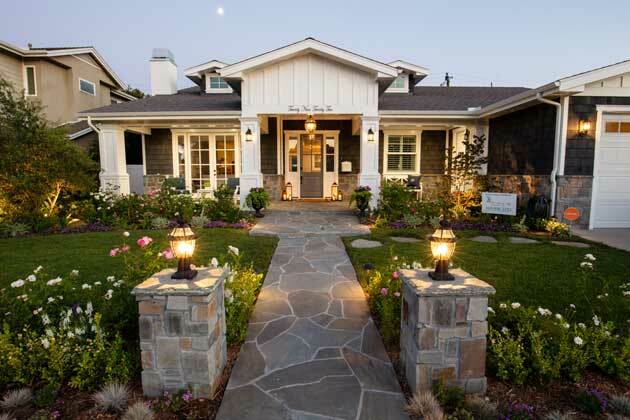 View the best landscaping and design portfolio in Southern California. Are You Ready To Bring Your Landscaping To The Cutting Edge In Beauty, Function, And Sustainability? If So, Call Us To Get Started!